Hypericum moserianum, more commonly known as St. John's wort, is a perennial shrub grown for its showy flowers, ease of care and drought tolerance. The plant blooms from July to September, producing numerous yellow blossoms. Legend suggests that the shrub first bloomed on St. John's birthday, and was named after him. Native to Europe, Asia and Africa, St. John's wort thrives in USDA Zones 6 through 9 and requires only routine maintenance to grow and flower in most temperate regions around the world. Plant Hypericum moserianum during mid-spring in a location that receives full sunlight throughout the day. Spread a 1-inch layer of coarse sand over the planting site and use a garden tiller to work the sand into the soil to increase drainage. Space Hypericum moserianum plants at least 2 to 3 feet apart. Water once per week during the first two months of growth to help establish the planting. Decrease the frequency of watering thereafter to once per week during periods of extreme heat or drought. Apply water directly to the soil, as moist leaves are more susceptible to fungal diseases. Apply a 2-inch layer of organic mulch over the soil immediately after planting to deter weeds and improve moisture conservation. Remove the mulch after two months to allow the plant to grow freely. Spread a 3-inch layer of organic compost around the plant each fall to insulate and add nutrients to the soil. Remove the mulch the following spring. Remove faded Hypericum moserianum flowers whenever possible to improve the aesthetic appeal of the plant and prolong the blooming season. Use pruning shears to remove any unattractive growth during spring, if necessary. Hypericum moserianum does not require supplemental fertilization to thrive and produce flowers. Use grass clippings, chopped leaves or pine needles to mulch Hypericum moserianum. 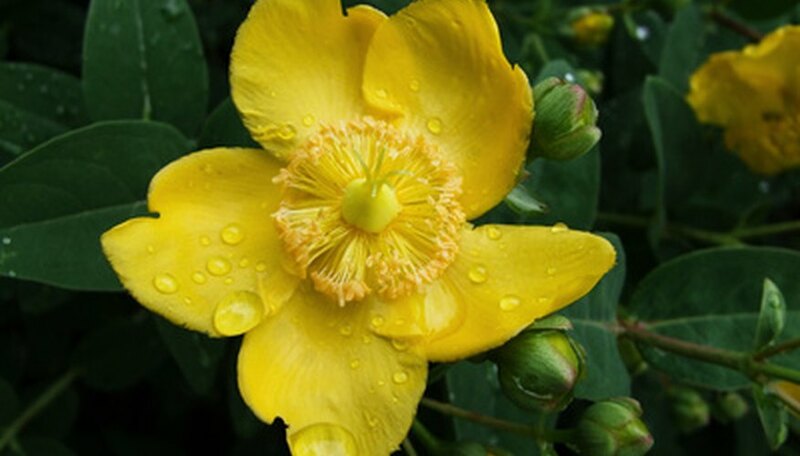 The sap of Hypericum moserianum may cause slight irritation if it comes in contact with the skin.